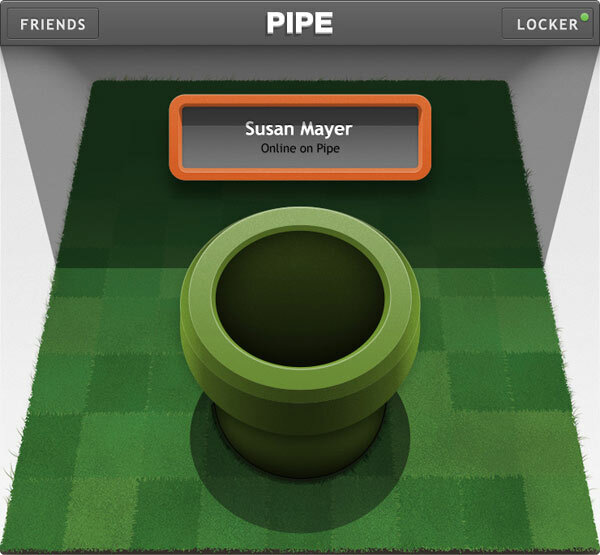 A new Facebook application which is called Pipe allows you to send any type of files to your Facebook friends. Simply select the destination and drag and drop the file onto the pipe application. Your contact will receive the file instantly. You can send files upto 1 GB with Pipe Facebook app. Pipe establishes a direct connection between the person transmitting the file and the one who receives. So your file is not goes through the Facebook servers. It is free P2P direct. When your contact is online, you can send files with a maximum size of 1 GB. If your friend is not connected to Facebook, the file will be sent to your storage space that is called Pipe Locker. The recipient will then have five days to retrieve the file. The maximum weight of the transmitted via a file Locker is 100Mb. You are not limited in the number of Locker you can create. This allows you, for example, to send multiple files to a friend who is not logged into Facebook. If the contact to whom you send a file does not have the Facebook app Pipe, he will receive a message via the notification system of the Facebook. As soon as your contacts will click on the notification, the application will be associated with your friends account. After installation that takes a few seconds, that person will be able to send and receive files using Pipe. There are dozens of P2P services. However, Pipe stands out from the lot by its ease of use and integration with Facebook. Unlike services like Yousendit, you do not have to register to use Pipe. Simply install the application. To get started with this service, please visit pipe.com. 3 Examples of Failed Social Network Leaders, Who's Next ?